I have visions of her recycling a lug wrench right over his head for that remark. 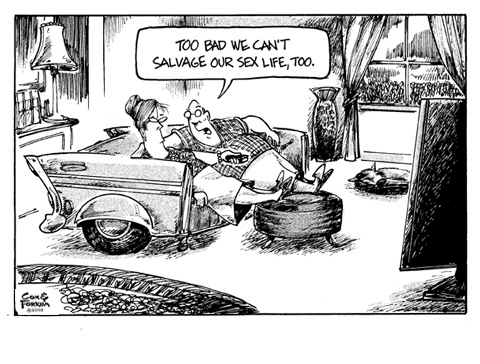 Seriously, they could take the family jalopy out to the local "lover's lane" and make out in the back seat (which I think the cartoon sarcastically hints), but she doesn't seem too willing to give up the TV. Notice who has the remote! "Looks like that could require cranes and pulleys..."
Gee, this is like watching the old Ralph Edwards TV show, "This Is Your Life". After 40 years of marriage, I feel this guy's pain. We just don't have a '57 Chevy love seat. To make this seem real, I imagine the wife watching either the Food Channel, "The Little Couple", or that baby factory family, "The Duggars". This page contains a single entry from the blog posted on July 24, 2011 7:17 PM. The previous post in this blog was Yeah, Baby!.